Bali's Ngurah Rai International Airport is the only major airport in Bali. 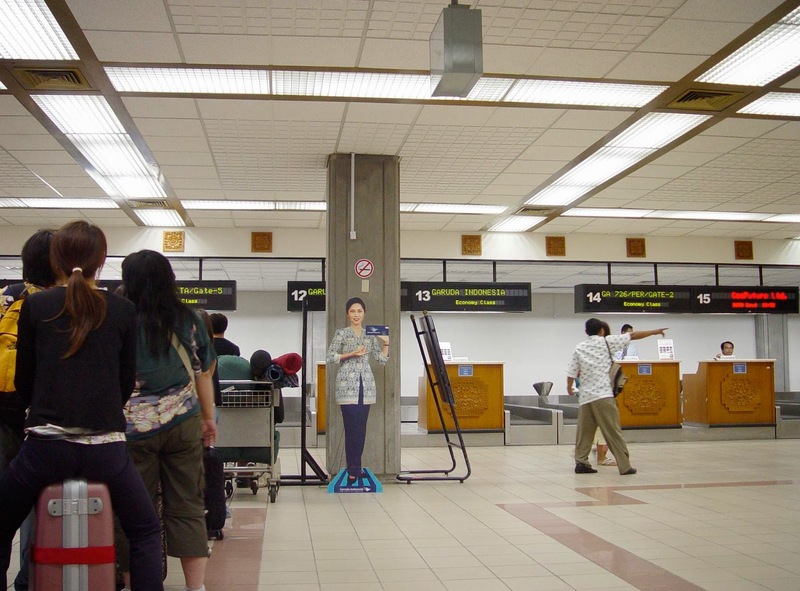 It often referred to as Denpasar airport though not actually located in Denpasar. The airport is approximately 10-15 minutes (depending on traffic) drive from the tourist center of Kuta Bali. When you arrival at the airport you will be required to purchase a tourist visa. If you need the change, you will give in USD. After buying a visa, you are required to go to another table where they check your passport (this must be valid for at least 6 months from the date you plan to leave Bali), take your arrival card (you fill in this form in the plane) and stamp your visa. You will then make your way to baggage porter collection. There are many standing around the baggage claim area ready to assist you with your luggage. If you need a hand then use their services (they will help you with your bags through the machine X - ray and if you have something to declare) but beware they will expect payment for this - the fare is IDR 11,000 ($ 1), but some they will try ask for more. Once you have gone through the X - ray and declarations you will find a row of ’money changers’. The rate is generally slightly less than what you would get in the way but probably still better than the rate you will get in Australia so if you need to change a bit's worth Rupiah here. Money changers is the last stop before you get out of the cab and the driver airport. There is personally waiting outside Denpasar Airport but sometimes a bargain for the same price as you get off the plane in a new country can be daunting. Many hotels near Ngurah Rai airport will include free airport pick up when order at night but if not airport transfers can be booked online in advance to ensure a smooth transfer to your hotel. One last thing to note is the departure you will be ask to pay a departure tax IDR 150000. It caught many people out when you not informed about the tax on arrival. This need to be paid in cash but there is an ATM at the airport if you forget to keep this number to one side.